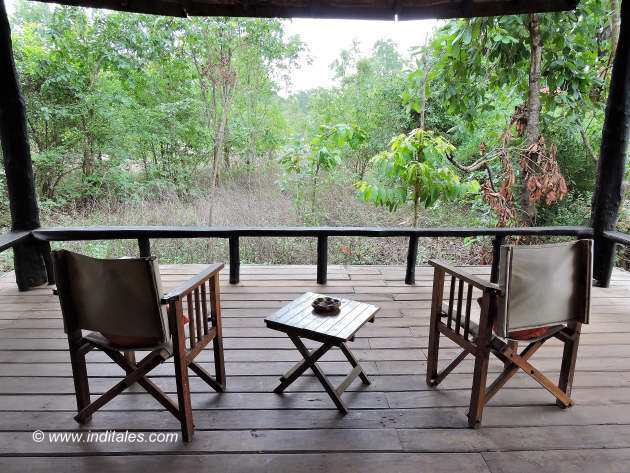 Kanha Earth Lodge is a signature jungle lodge by Pugdundee safaris. This was their third lodge I was to experience after Denwa Backwater Escape at Satpura and Kings Lodge at Bandhavgarh. I was sure of good hospitality. But my eyes were looking for the design and décor of the Kanha Earth Lodge. And how they have blended the tribal look and feel there. I must say I was happy to discover the vast use of metal art in this property. The reception area where the lodge team receives you on arrival and on your return from the safari with a wet towel and some cool drinks to nourish you have 4 lovely wooden pillars carved with tribal motifs. I could admire them for hours. On the floor 3, metal musicians sat around a bowl filled with water and flowers. Lanterns, that I knew by now would be used for lighting in the evening were resting aesthetically on a tree. We moved in to be welcomed inside a lobby come bar area where a sit out in bright orange provided brightness to the otherwise earthy décor. Dividing wall had an opening with a huge metalwork piece – almost like a stand to put oil lamps in a temple. A similar artwork in small pieces I would find in my room later. Even the garden furniture is done in metal – and appears straight out of the hands of a tribal artist. Walls are again adorned with wooden masks. But here they have the company of tribal jewelry. My room was spacious, to say the least. A bright sit out that looked at the wilderness from the comfort of the room. And a huge sit out was just outside the room where one can feel the wilderness with just a roof above. Lighting in the room is a bit subdued. So if you want to read, you would need an extra lamp. Having said that given the hectic schedule with 2 safaris a day and a village or a birding walk thrown-in, there is hardly any time or energy left for reading. There is wi-fi available in the common area. So you are not really disconnected from the world. Phones work depending on the network you use. Otherwise, the landline of the lodge can be used for communicating. There is a library full of books on wildlife, nature, birds etc. You can use some of these books for reference when you come back from Safari. 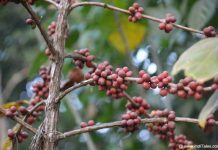 Apart from the excellent properties that give you a luxury experience in forests, what you would admire about Pugdundee Safaris is their team of the naturalist who knows the jungle like the back of their hand. They help you spot animals and birds, they show you the flora and they tell you amusing stories of the jungle. They take care of you on the safaris including serving you the much-needed refreshments. And let me tell you this is a much-appreciated service – to have food while you know you could be a food for the inhabitants out there. I highly recommend Kanha Earth Lodge for your Kanha National Park experience. Nice places for wild life tour and great article thanks for sharing…. Happy that you liked the blog post…. Safaris are independent but these guys organize them for you of you stay with them. Sometimes they come up with packages that includes Safaris and other activities. Wonderful article. Thanks for sharing it. Mesmerizing pictures. I think those are fortunate who travels to the desired locations, your write up is discussing the most important things in details one should take care of. Thank you Vinod Ji. I am indeed blessed to have a Travel Blog and lets me travel and also connects me with other travelers.